Field Of View.... it's all about perspective! 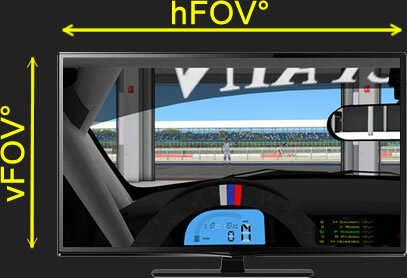 There are many debates across many forums regarding FOV and whether it's important to have it exact (mathematically) when gaming or sim-racing. 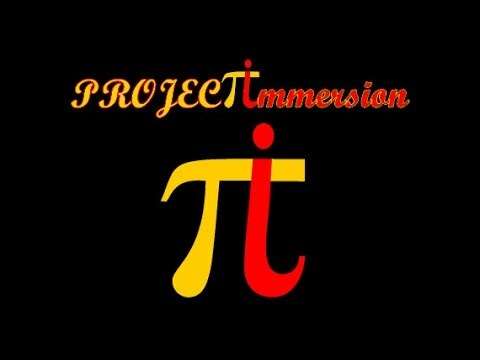 If you have arrived here from one of the many links on the afore mentioned forums then it's most likely that you either want to be more immersed in your game/sim or you have a preconceived perception that the right FOV means seeing everything you want to see on the screen before you so you feel most at home. Either way, I'll try to explain my take on it that has built up over many years. Well, from my perspective, yes, correct FOV is important, but not as important as having fun and if having your FOV mathematically correct means that you don't get it, then my advice would be to enjoy your game or sim as you like it. I have found that the more of my peripheral vision I can fill with cockpit or darkness the more immersed I am, hence sitting here with an 84" wraparound screen 26.5" away from my eyes which just about fills it when looking ahead. This of course may not be possible for everyone so my advice would be to blackout anything above/below and at the sides (essentially what OR does to fool your brain/periphery vision that nothing else exists outside of the 'telescope' view and you have to move your head to see more - trackIR solves this with screens to some extent, again as OR does with positional/head tracking) to give a much greater immersive feel.... or just turn the lights off when racing and pull the curtians to, you'll get enough light from the screen to see the wheel and gear stick! and then double it to give me the overall vFOV angle in degrees (shown in green on the image above). Most modern games/sims use Hor+ (horizontal plus) scaling which means the vertical FOV (vFOV) is fixed and in some cases (mainly in sims) can be adjusted in-game, while the horizontal FOV is resized automatically depending on the aspect ratio of the in-game resolution i.e. a wider aspect ratio results in a larger FOV horizontally, hence the tag of Hor+. There are a few exceptions to Hor+ games/sims and Project Cars is one of them, the adjustable aspect is Horizontal (hFOV) and the vertical scales up and down to suit the aspect ratio of the resolution. My current FOV is classed as Super FOV or sFOV because it it essentailly life size or a 1:1 representation. It is wrapped around me at approx 170° across an 84" (diag), 21:9 aspect ratio screen, 26.5" from my eyes. Of course, seating positions have to be adjusted to my liking and the angle of view (vertical head tilt) is different in every sim, but with a bit of tweaking here and there I can get it fairly comfortable and within a 5% tolerance of acceptability (to me). For the purposes of demonstration I've put all files together to show how close they are when using the calculator (and in-game seat repositioning where necessary), it's a bit rough, but you'll get the idea... although there are 3 different methods in play, all come more or less the same and with a bit more tweaking, could quite easily be even closer. By default, most sims (not all) are set to between 50° and 60° vFOV, so if I demonstrate what this means versus other options (e.g. correct mathematical FOV) then it all should start to make more sense. 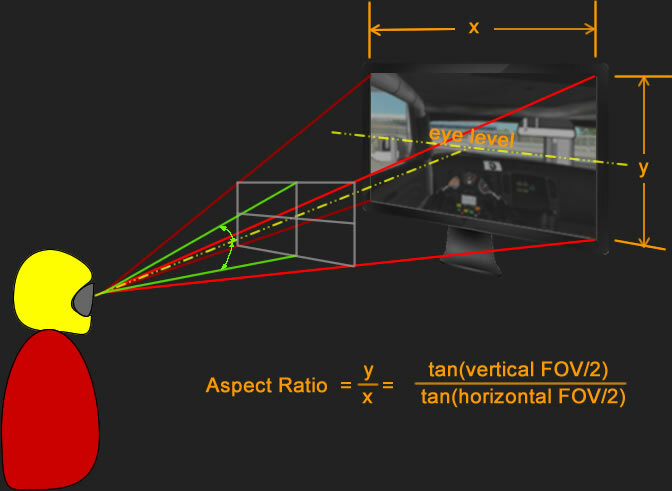 The default FOV is set by the sim authors so that you can appreciate most of the onboard equipment on your screen, whether you are 25" away from it or 3M and irrelevant to the actual size of the monitor, I mean, there are so mant different sizes out there, how on earth could a coder account for them all and besides, they (most software houses) take hours++ over the cockpit interioir, so why not show it off? Recently however, some of the developers have actually been using quite a good starting point as their default FOV. One thing I must highlight is seat positioning. It is very normal to have to adjust your seat position in game, so make sure you know how to do it and bind some keys to it. The four axis that are most important are to enable you to move the seat: Forwards, Backwards, Up and Down. This usually represents the eye position in the cockpit. My single desktop monitor is 28" 16:9 aspect, so a little above average size I guess, but close enough, so I'll use that for all the calculations from here on in along with rFactor and the ISI Nissan 370Z as the cockpit of choice. When seated I'm about 32" from eyes to center of screen. It's 4K resolution but this is unimportant and irrelevant to FOV, I just thought I'd throw that one in there, the aspect ratio is important and relevant to the FOV calculations, not the resolution. Also to note that having triple screens does not alter the vFOV, just the aspect ratio (e.g 48:9), it does however alter the hFOV. which by any standards is not asthetically pleasing at all! which does look a bit better and as I'm tall IRL, I tend to have the seat back to the stop anyways and a bit lower down than midway. You could mount the monitor on top of the wheel somehow (not literally, but over it rather than behind it) and get closer, so lets say we give this a go... bringing the monitor to 24" from your eyes and a little higher up to clear the wheel body, right over the body of it, a further improvement at minimal cost. That gets you to 32° vFOV. It's a bit better once again, you can now see most of your guages and it will feel fairly realistic, but not quite how it seems in a real car as there is zero peripheral vision. Option 2 - add another 2 monitors to extend the peripheral vision. The screen is now massive though and towers above the desk and with the set all the way back you can actually see the drivers mirror and the rear view mirror too, bonus! On to Option 2, a couple of extra monitors, one on each side at an angle of about 45° to suit rF2 Multiview, best get another graphics adapter whilst we are at it though unless you have a top of the range one already. So, I had a 28" to start with, so I add 2 more and buy a 'tri' stand that allows me to put the central monitor above the wheel again at 24" from my eyes to the center of the screen. I'll keep my in-game seating position as far back as looks comfortable when glancing and the vFOV of 32°. Now thats better! But you have to put up with bezels, which for me spoiled the immersion, that and running 2 GFX cards in SLI and all the drama/heat output/game support around that... which is doable, but not simple to get in to and get good results, especially if games/sims are in early development/alpha/beta/gammer/RC status. And of course there is Option 3, Super FOV. Which if you look around my website (this one), you will see I have just about achieved so I'm not going to dwell on it's merits here. Option 4, VR... it's just not ready yet, and nor are the sims I race in regularly, not by a long shot. I do have a Oculus Rift DK2 and have given it a good go, but to me, it just doesn't hit the mark... yet... it's a Development Kit, not a finished product after all. I will purchase the OR CV1 when it's lanched to give it a shot as I was initially WOWed by the OR DK2 and the 3D immersion, but soon got fed up of having the thing strapped to my head, the lack of clarity, the SDE (screen door effect) and the major lack of peripheral vision that I'm used to and having to take it off to have a swig of tea/coffee/wine/beer/gin etc. ...with a 3rd party application called vorpX, it allows non-VR ready games to be run in VR mode essentially.. its a faff to get going right and the menus are difficult to navigate, but it does work. For a comparison of FOV against multiple monitor sizes, please see my slideshow on YouTube (best viewed in full screen 1080p) - hint: use the pause button. This is a comparison of various vFOV in rFactor2 calculated mathematically against common screen sizes (apologies if your screen size is not included). The orange area represents your natural Field of View (including your peripheral vision, which is a very important part of immersion) when looking straight ahead. The assumptions are that for any monitor under 35" it will be mounted over the body of the racing wheel to get it as close to you as possible (if you are bothered about FOV in any way, this is the first step). Over 36" are assumed to be behind the wheel body due to size & weight. Also assumes that your eyes are level with the horizon on-screen. Only single screens are accounted for as if you have invested in triple screens and SLI graphics to support them adequately, you are bound to have done your homework first so know how it will look! I hope this has been useful and please feedback if you have any comments or would like to add to this, I'll consider any thing that is correct and relevant for inclusion here for the benefit of others. 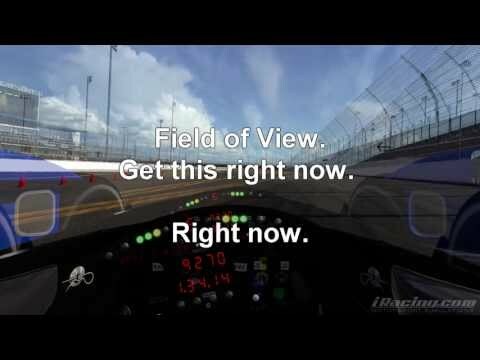 Empty Box produced and shared a video in his Sim Racing 101 series on youtube on Field of View - Seeing is Believing (Ep7), you can find it below along with an extract from the video page. 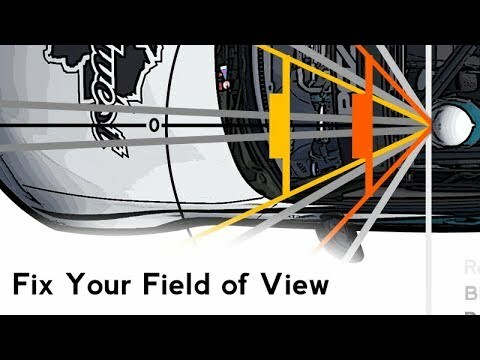 Extract from original video: "The field of view you see in the video will not necessarily match up with what is correct for you. However, I can't not try and demonstrate it. Just know that what I show with my FoV is the same regardless - running too high will always look warp speed. Running too low is not shown because no one ever does that - but it is just as bad rest assured. As we go through things from here on, this should be the number one groundwork thing. Yes, you can work around it (I did for years), but it really just makes life more difficult so to speak. Yes, it's disconcerting doing 200 with a guy right next to you that is "invisible", but so is not being sure if you actually have a gap. Car placement is important, and having things come at you at the proper speed is crucial to placing your car precisely where you want it, lap after lap, all day, every day. Field of View is important, people. Feeling like you are going slow can be adjusted to, but the extra precision is nearly irreplaceable. You will go faster, easier. Get your screen as close as you can and prepare to go blind!"